I love it. Love and love and love it. Especially in my house. So I kind of use it a lot. If I had all the say-so, more moolah, and Little Men without a penchant for making messes, then it is quite possible there would be even more white around my house. 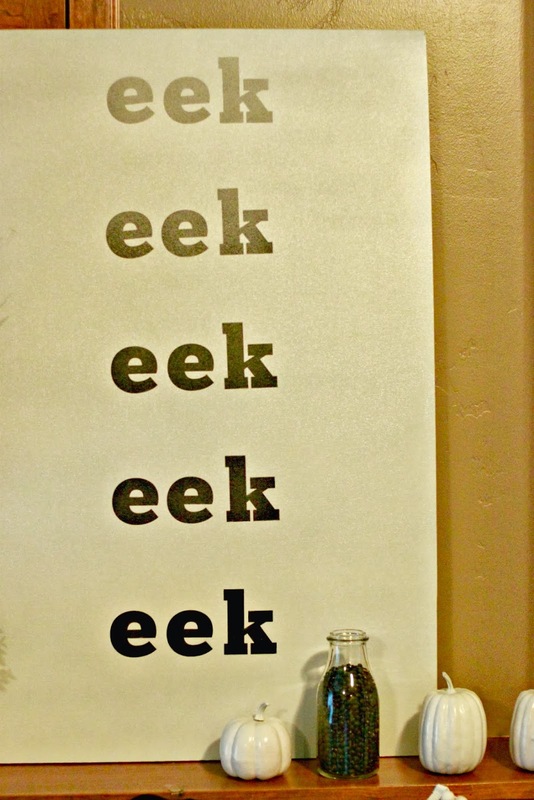 For Halloween this year, I actually did a little decorating. 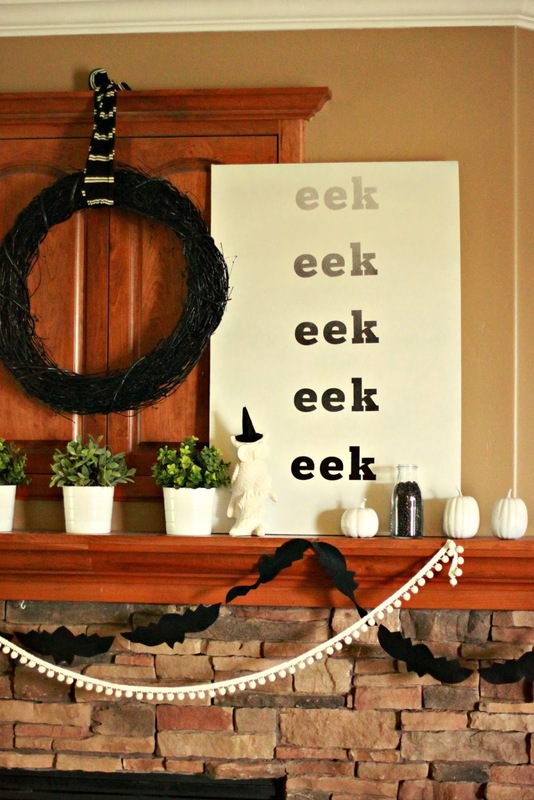 If you have been around this here blog for a bit, you know I don't typically decorate for Halloween. However, this year, I just couldn't help myself. We have a pretty great mantle. It is big and spacious. The wood is pretty (yes I probably would love it a little more if it were white). There is only one little hiccup with our mantle area. There is a cabinet built into the wall above the mantle meant for a box TV. It is a fixture that without some minor construction and the previously mentioned moolah, will not disappear. So work with it I shall. That is what lead to me dreaming up the giant EEK canvas. After I painted the Ombre Eek Halloween Art, I added in some more pops of white and black. 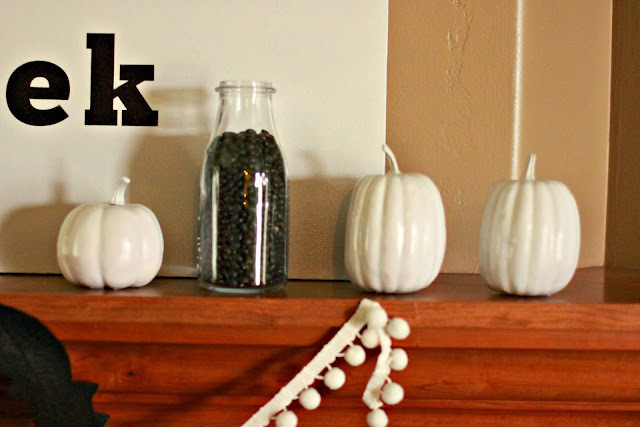 I spray painted some cheapo plastic pumpkins. Seriously they were like .98. 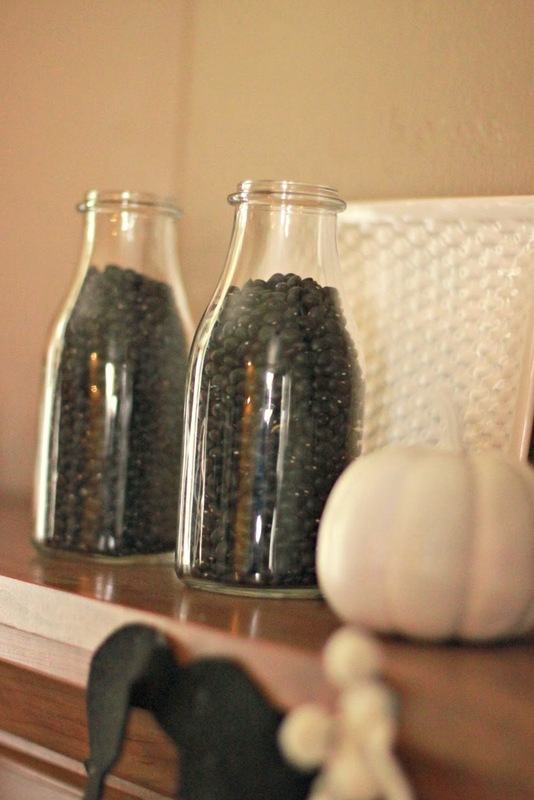 I filled some milk bottles with dry black beans. Yup, ordinary black beans you can buy at the grocery store. In one more attempt to hide the TV cabinet, I put up a wreath. 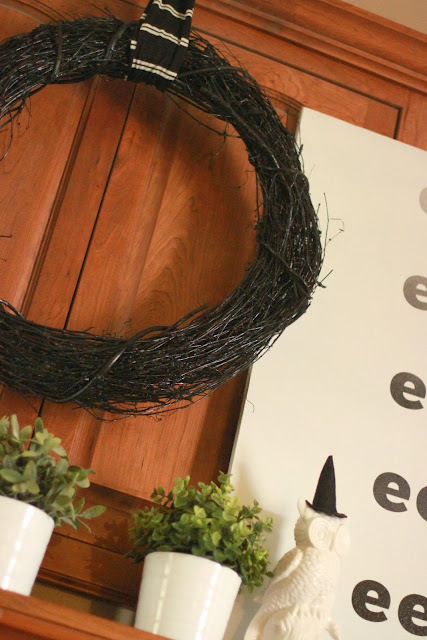 I bought a plain grapevine wreath and then spray painted it black. I added a black and white fabric sash. All this black and white, I still needed a touch of Halloween. 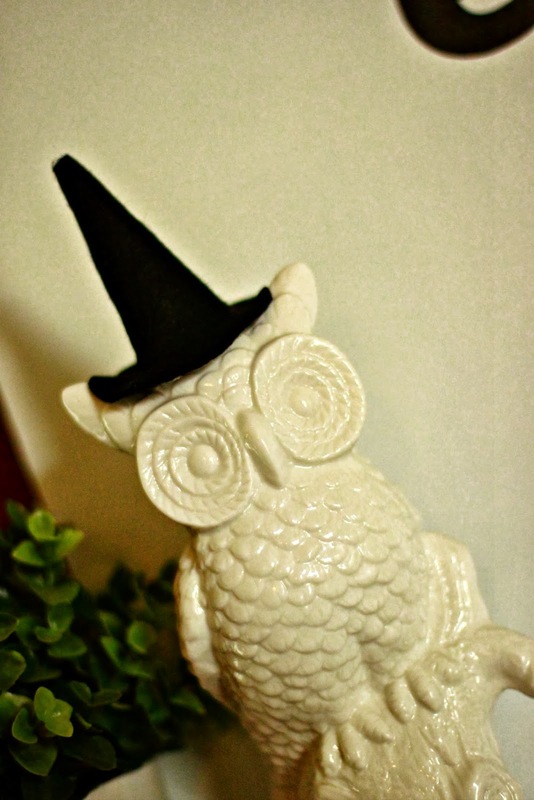 So I made this itty bitty witches hat for my little white owl. (I gave a sneak peak of this Owl yesterday on Instagram--@larissa-anotherday). A little felt and some hot glue and Little Mantle Owl is all boo-tastic. For the finishing touches, I added a felt bat garland and a white pom pom garland. Now we are practically ready for frights, cackles, and all things Halloween. 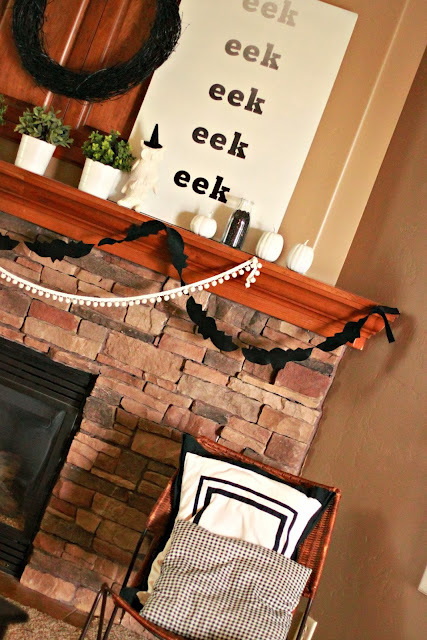 Ooh and I have another fun and easy Halloween decoration idea involving vinyl...we all love vinyl. I really loved the way that turned out! It looks great.